Ginny here. In mid January, the U.S. Postal Service began celebrating the 2014 Lunar New Year by issuing this elegant Year of the Horse Forever stamp by illustrator Kam Mak of Brooklyn, NY. The Year of the Horse stamp is the seventh of 12 stamps in the current Celebrating Lunar New Year series. Beautiful postage is only the beginning of this longest and most important celebration in the Chinese calendar. Also known as the Spring Festival, with life just beginning to stir in the grip of winter, legend has it that Buddha asked all the animals to meet him on Chinese New Year. Twelve came, and he named a year after each one. People born in each animal’s year would have some of that animal’s personality. It’s Chinese year 4712, Year of the Horse, which begins this year on January 31. Chinese months are lunar, beginning on the new moon and the New Year celebrations continue for two weeks until the 15th day of the month. That’s the night of the Lantern Festival, with a parade under the full moon and the famous dragon dance—a dragon made of paper, silk and bamboo that can wind for 100 feet. Lots of the traditions that we associate with New Year’s celebrations in the west are similar for Chinese New Year. On New Year’s Day, I mentioned first footing on Hogmanay in Scotland to bring luck INTO the house. In China, we’re cautioned not to sweep the floor on New Year so we won’t sweep good luck OUT of the house. Fireworks and noise makers are meant to ward off bad energy and bad luck everywhere—they scare off the monsters and chase the winter away. People born in Horse years are bright, cheerful, popular, and fun loving. They find people and crowds exciting, and love parties. Usually they don’t need to struggle in order to succeed and obtain the fine things life has to offer. Rembrandt, Harrison Ford, Aretha Franklin, Chopin, Sandra Day O’Connor, and President Theodore Roosevelt were born in the year of the horse. Horses have a carefree nature and need ample room for self expression. Horses will tell you exactly what is on their mind; they are frank and dislike hidden agendas. So this is the time for issues to be out in the open, especially with family members. 2013 belonged to the Snake so the time for secrecy was then, not now—everybody knows they keep dark secrets at Slytherin! 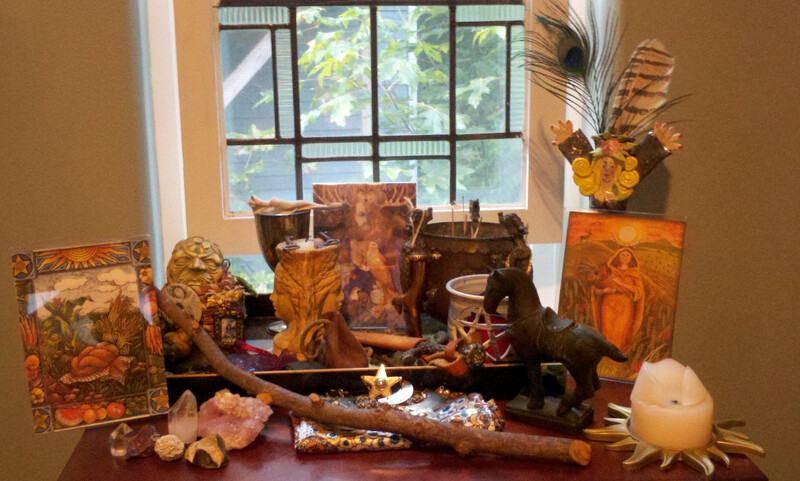 Remember my Lammas altar with a horse for Epona, a Celtic goddess who brings abundance and inspiration? Speaking of inspiring horses (we were, weren’t we?) 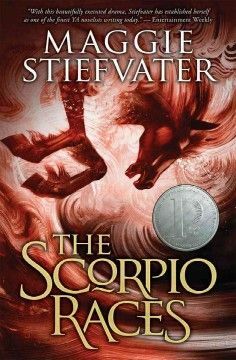 The Scorpio Races by Maggie Steffvater is worth a read. Imagine trying to tame and ride a wildly magical sea horse with the instincts of a shark, for the most dangerous race in the world. Jessica recommended this fascinating, original retelling of the ancient legend of water horses and the images have stuck with me for weeks. It’s easy to see why Horse year is considered fortunate, bringing luck and good things. Magical Horse has supernatural powers, is heroic, strong, and can even fly! The Chinese Goddess Kwan Yin’s white celestial cloud horse soars through the heavens bringing peace and blessings. Happy New Year! Don’t let it pass without a nod. We’ll be wearing red and toasting new beginnings with rice wine. How will you celebrate? Wear red, of course, and you could send good luck to the horses at Whatcom Humane Society by making a donation. When you’re done with your good deed, sit back, sip some rice wine in the Deep Winter and enjoy these wonderful images of Chinese New Year, celebrated around the world. Ginny here. I love creating ritual. I always feel like I’m crossing a threshold into a different room, familiar and comfortable but different—a room that contains mysterious and exciting images, favorite quotes and poetry, evocative music, tastes and smells. One of my favorite parts of that creative process is collecting and assembling the visual cues—the stuff that populates my ritual, and usually it’s collected on an altar. Sometimes it’s a circle defined on the floor so we can sit around it. Sometimes it’s on a table, a mantle, shelf or windowsill. Sometimes it’s formal and sometimes it’s off the cuff. This picture is my Lammas altar last year. This altar stays in the same location in my library and the objects change with the seasons. Lammas is in early August, and celebrates the first harvest, breaking bread, abundance. There are celebrations in many Native American traditions that coincide with this Celtic cross quarter day. You can see the images of the grain goddess, the green man, the loaf and harvest and the horse. Epona is a Celtic horse/woman who represents fertility, inspiration and abundance. She is a protector of horses, mules and dogs and in Gaul, her image was placed on buildings occupied by animals. Not all altars are this self-conscious. They come in all shapes and sizes and we create them all the time, often without thinking about what we’re doing. The main thing that makes an altar an altar is the fact that we’re honoring something with intention or memory. Do you display those stones and shells (beach glass?) from your vacation on a shelf with pictures (got selfies?) and postcards, perhaps a restaurant menu, concert tickets or the cork from a great bottle of wine? Do you have sports trophies? Maybe a signed baseball and a glove and a team photo from that season? Those are altars honoring moments of your life and the people in it. For Midsummer last year, Jessica and I decided that we would invite the tropics to our altar. We spread out a beach towel with tropical fish on it, added bright flowers, a tinsel palm tree, images of the sun, plenty of candles, and glow-stick hoops of all sizes. That night we honored the longest day of the year with pina coladas (with umbrellas! ), guacamole, and steel drum music, wearing flip flops and leis. We celebrated the sun and spoke of dragons, salamanders, turquoise water, shells and sand and heat. It was FUN! It was ritual. It was memorable and special. And we didn’t get any good pictures of it. Sigh. Here’s a timely glass display that struck us recently as a 12th Man altar to Seattle’s beloved Seahawks. When we talked with Jenny Reich at Whimsy Art Glass Studio, she responded that as she set this up, the first thing she thought of was an altar. Go Hawks! So there you have it. Altars are everywhere but sometimes they just don’t look like what we’re expecting. Some are permanent, some disappear after one use. Some are formal and designed over time, some are casual and pop up on a sudden impulse. What do you think of as an altar? Share your thoughts and images with us here. Ginny here. As I write my first entry, it’s New Year’s Day 2014. It’s also the day of the new moon. How appropriate for beginnings! This newborn called Sacred Return is embarking on a life that’s all about celebration, ritual, tradition and there are so many traditions that go with this day. We pop the champagne and toast the new year, sending good will into the universe. We make lots of noise to ring in the year and chase the old year away, along with any bad spirits that may be hanging around. The baby with the banner takes the place of the old man with the sickle. In Scotland, where New Years is Hogmanay, we first foot our family, friends and neighbors so that good wishes enter the house before anything else! We also think of resolutions today—of the shoulda, coulda, woulda things that we’d like to accomplish or correct in the coming year. Well, I’ve shared with you about the Tarot retreat last summer where the seed of the Sacred Return workshops was planted. Now I want to share a book I read last year that changed the way I approach everything…literally…everything. Jessica read it first and it’s informed our planning of this labor of love called Sacred Return. The book is called Three Simple Steps and the author is Trevor G. Blake. Resolutions are about intention—I intend to change something or do something. But think about this: resolutions tend to come from a place of lack, from our disappointments or complaints. Trevor talks brilliantly about always stating what you are for, rather than what you are against. Then you are working with positive rather than negative energy. There’s more to it, obviously, and I urge you to read this life changing book—there really are three simple steps and they can make all the difference for a happy and prosperous new year. Check out Trevor’s New Year’s blog about living fearlessly and setting intentions for the things you really want to do. Sacred Return is an adventure that’s beginning now. We look forward to sharing it with you as we celebrate the seasons of 2014. Happy New Year!